The weekend of April 30th I will be walking 39 miles in the Avon Walk for Breast Cancer. This may seem like a lot to some. And that, my friends, is because it is! But it’s for a cause that is near and dear to my heart. Today I am praying for yet another woman who was diagnosed with breast cancer and who today is undergoing a double mastectomy. Every 3 minutes someone is diagnosed. So in the time it takes you to read this article, a couple more women would have received the horrible news. But just because my treatment is done and I have been given a clean bill of health does not mean I will sit back and do nothing. I have joined a great team in my neighborhood, the Step Sisters, who are participating in the Avon Walk for the 5th year and who, over these last 4 years, have raised over $300,000 for the cause! I told you the team was awesome! 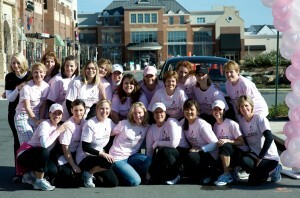 Next Saturday, April 9th, is our biggest fundraiser of the year, the 4th annual Brambleton Ribbon Run 5K/10K. All net proceeds from the Ribbon Run go to the Step Sister team and the Avon Foundation which distributes funds for awareness and education, screening and diagnosis, access to treatment, support services and, scientific research. If you are in the northern Virginia area and are interested in participating in the Brambleton Ribbon Run, there are only 50 0 bibs left (see update below)!! Sign up today and use discount code BRR2011 for $5 off the 5K or 10K registration fee. There is also a Kids Fun Run with only 100 spots left. So don’t delay, register today! Don’t feel like registering for the race but are interested in volunteering your time? No worries, there are still ways for you to help! We are in dire need of course marshals for race day. Course marshals are placed along the race route to direct and cheer on runners. You must be 18 years of age. It is the easiest job yet you still get to be a part of the excitement and rush of race day! To sign up to be a course marshal, go to the Ribbon Run Signup Genius and scroll down until you see the course marshal section. Thanks so much for taking the time to read our blog and especially this article. Our intention on Everyday Road to Healthy is never to pressure anyone to participate or donate to something. There are just a couple events that Deena and I are heavily involved with and feel so very strongly about that we like to share with everyone who will listen! 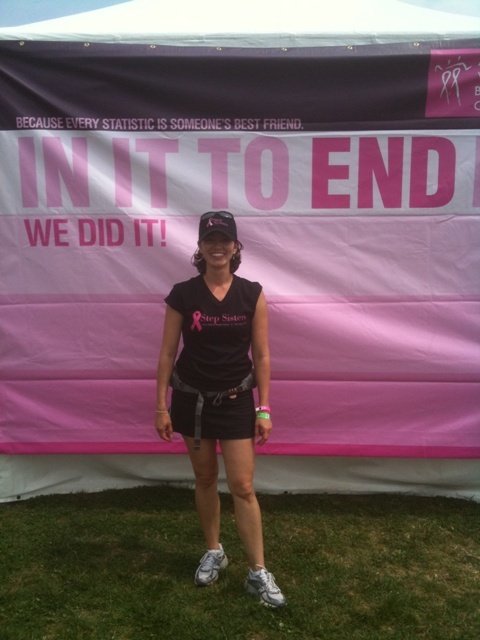 And I will definitely be documenting my walk, blisters and all, so you will all feel like you were right there with me! Update: The Brambleton Ribbon Run 5k-10k is SOLD-OUT! Did you miss out? Due to the overwhelming response to this event, we are offering runners an opportunity to register at packet pick-up or on race day for $10 and run just for the cause of fighting breast cancer! (no t-shirt, no swag bag, no bib, no time, JUST a good run!). Runners will be provided with a wristband to indicate that they have registered as a Just for the Cause participant and signed the required waiver. We still have a limited number of Kids Fun Run medals and shirts, so please register your children today to secure them a spot. Fore more details, visit www.BrambletonRibbonRun.com. Volunteers are still needed as Course Marshals. To sign-up, visit: http://www.signupgenius.com/go/draftbrambleton1. Even if you are not participating in the events, you are encouraged to cheer participants along on the course and come out to enjoy the festivities! Previous post: Happy New Year! Get Ready, Get Set for the 28-Day Challenge!